Amazon Echo owners can now access the latest news, election coverage, and top stories from CNN’s on-air coverage minutes after broadcast. CNN’s new “skill” (Amazon’s word for an Alexa voice app) improves listener experiences by delivering audio news straight from CNN’s world-class anchors and reporters around the globe. Content from the likes of Anderson Cooper, Wolf Blitzer, and John King are available as soon as 5 minutes after broadcast. The skill helps users quickly discover the latest stories CNN is covering and dive into any one of them for CNN’s full broadcast audio coverage. Users can request the latest news anytime or explore top stories CNN is covering. 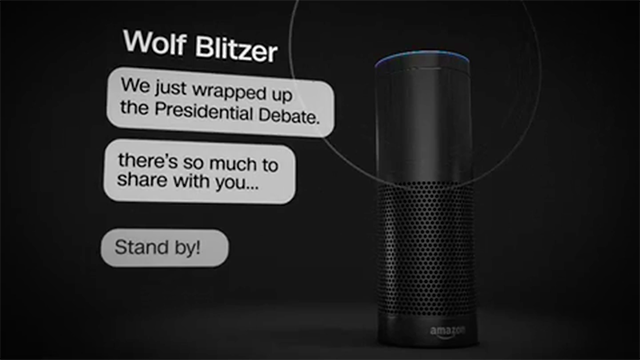 The new skill compliments CNN’s previously launched experiences on Alexa, which include Alexa’s built-in Flash Briefing and CNN audio through the TuneIn audio service.